Simple, healthy, delicious. Now, that’s a winning salad in my book! Is this even a recipe? Well, I’m not sure – but it’s one of my favorite salads to eat and so it’s gotta be on the blog. I’m not even sure if arugula is really a “mainstream” kind of salad? It’s sometimes difficult to find at my local grocery store, but I can always find it at Trader Joe’s, which is also very close in proximity. One of my favorite things about this salad is that it doesn’t need to be dressed up. 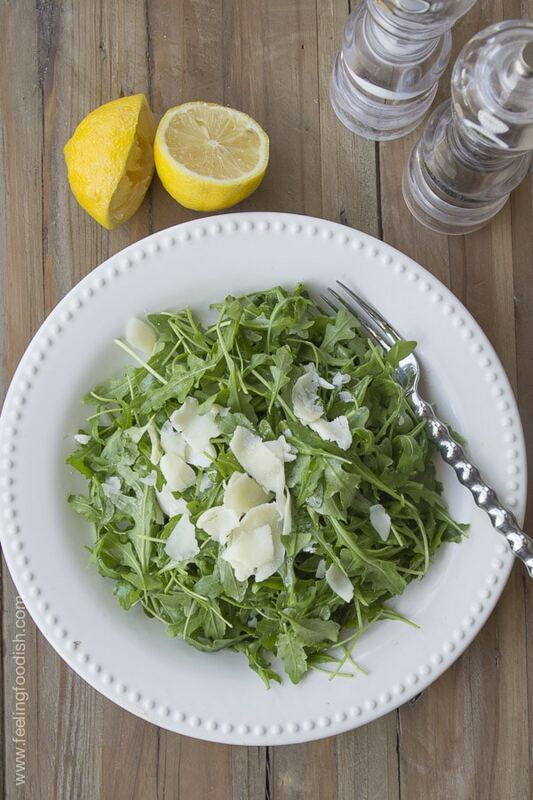 It’s delicious with fresh lemon juice, a drizzle of good olive oil, and some shaved parmesan. That’s it! It’s also realllly filling assuming you eat a heaping plateful of it. Now, that’s definitely a good thing, as I’m always trying to incorporate more leafy greens into my diet. The last time I had this salad in a restaurant, I can recall being so stuffed from the salad alone that I wasn’t hungry for the main meal. Now how often does that happen? Typically, salads are small (assuming they aren’t a main course salad). 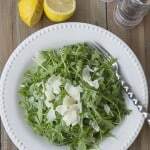 I’m going to try growing my own arugula this year because fresh picked arugula will make this even better!